SOME of the best racing has been saved for the last day of the Melbourne spring carnival with both the Group 1 Emirates Stakes and the Group 1 Darley Classic. 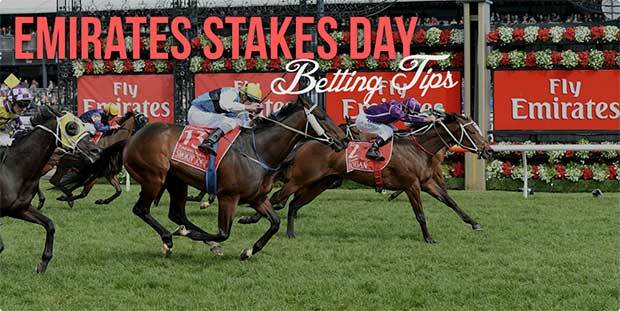 The Emirates Stakes features top quality thoroughbreds which have competed well throughout the carnival already. Many are coming out of the Cox Plate and there’s a strong international presence with Vadamos and Godolphin’s Scottish. The Darley Classic has lost some of its shine this year, but the field is still full of slick sprinters. The likes of The Quarterback, Fell Swoop and Spieth are in the field which should make for an interesting betting affair. Nine races on the card at Flemington this Saturday and we have a full betting guide, complete with updated odds and free tips. If your horse finishes second in the first five races on Emirates Stakes Day, CrownBet will give you your money back in bonus bets up to $50. Wait For No One has a strong winner on debut at Caulfield and it has winning claims again. The Hayes/Dabernig-trained colt was taken on in front last start, but it found something extra on the line and that bodes well for this. Current favourite at $4.60. Azazel was a smart winner at Moonee Valley on debut and the form out of that race should be strong. The son of Snitzel settled back in the Inglis 2YO before it quickly led around the home turn and kicked away with style. It draws the middle of the pack which will give it options and there is plenty of support at $4.80. Resin is a trial winner for John O’Shea which has been specked at $6.50. The Exceed And Excel filly has the breeding to show up on debut and James McDonald has a great record of winning the first race on the card. Watch the market for any late moves with this runner. Kilmacurragh was an easy winner at Pakenham last start and although this is a big rise in class, it looks to be a gelding with promise. It defeated Howard Be Thy Name on debut before running two good races at Sale and Flemington. Drawing wide is awkward, but we’re expecting a big effort. $6 available with bookmakers. Hipparchus is hoping the Sydney form continues after it finished second behind My Giuliano at Randwick last start. That level of staying racing in Sydney isn’t overly exciting, but Hugh Bowman is booked for the ride which does give us confidence. A touch short at $4.60, but could be worth including in selections. Tom Melbourne ran a career-best race when second behind Oceanographer in the Lexus Stakes last Saturday. The Freedman-trained gelding is trying its hardest to return to winning form and this field looks much easier than the Lexus. Good winning chance if it hasn’t already run its grand final and punters are happy to take the $2.40 on offer. Francis Of Assisi has the 2017 Melbourne Cup in its sights after an effortless three-length win in the Bendigo Cup. The Charlie Appleby-trained gelding is another European hurdler which is making a mockery of the Australian staying ranks and it looks to be a great winning chance again here. It opened at $3.50 and has drifted out slightly to $3.60. Vengeur Masque is in the right stable for this and it has the breeding on its side. The German son of Monsun finished eighth in the Caulfield Cup which was a much better run than expected at odds of $101 and its start prior was a fourth behind Melbourne Cup winner Almandin. Increase in distance suits and the $9 shouldn’t be overlooked. Niccolance has been an impressive winner at its last two starts and its recent win at Randwick was quality. It defeated subsequent winner Comin’ Through by 1.8 lengths and it has gone to another level this campaign. Drawing wide isn’t ideal as it likes to set the pace, but it’s a strong chance at $4.20. Verstappen is an impressive three-year-old which has won two from three starts. The Danny O’Brien-trained colt won by 2.25 lengths at Cranbourne last start and it looked to have plenty more wins in store. This isn’t an easy target, but it drops down in weight to 54kg and will be tough to beat at $7. Dam Ready didn’t cope with the slow track at Moonee Valley last start, but it has a good chance to rebound. The Hayes/Dabernig-trained gelding has form behind the likes of Saracino, Ken’s Dream and Archives. That should be strong for this and the $13 is worth taking for value. Mabeel was disappointing when finishing 12th in the Moonga Stakes last start, but the Kiwi gelding is much better than that. It has form behind Kawi and Sacred Star in New Zealand and it has been backed as if it could take this out. The $5 is very short considering its fresh up effort, so there must be plenty of stable support and this field is relatively weak. Lucky Paddy is a three-time winner from 12 starts which ran third behind a subsequent winner last start. The Darren Weir-trained gelding is twice a winner at this distance and it drops nicely in weight to 54kg. This is another rise in class, but it has win claims at $6.50. Carlo Bugatti is a European import for Team Williams which finished third in debut before winning at Mornington. That came in 2015 so it has obviously had some issues, but the betting suggests a nice run will come here and the combination of Williams, Hickmott and McEvoy is on fire. Punters weren’t sure what to make of Lady Le Fay last start. For some reason jockey Hugh Bowman took it down the slowest part of the Moonee Valley track – whether that had anything to do with Winx running later in the day, we’re not sure, but it wasn’t great to see. It steps up in distance here and the $5 on offer is a good price which punters will be eager to get back. Happy Hannah has drawn wide in barrier 17, but it will get back from that draw. The Snowden-trained mare flashed home late to finish third at Randwick last start and it’s getting back to its best form which saw it run third in the Vinery Stud Stakes. Will need the pace on up front to show its best, but the $15 is a decent price. Denmagic paid $61 last start when running third in the Myer Classic which was way over the odds. The David Pfieffer-trained mare fought well after getting a good run throughout and having James McDonald in the saddle for this will help. It’s finding it hard to win a race, but it has class so consider here at $6.50. The United States was a strong winner of the Crystal Mile before running on well for fourth in the Cantala Stakes. The Robert Hickmott-trained horse steps up in distance which is ideal and it might be able to break its Flemington duck after four starts. Not the easiest race to win, but consider the $4 after it opened up at $3.90. Scottish ran very well for second in the Caulfield Cup behind Jameka and it is regarded as a better horse at this distance where it has won three times. The five-year-old entered Australia with great form in Europe and that’s likely to stand up well in this. The long Flemington straight will suit and it’s one of the horses to beat here at $4.80. Endless Drama is another European import which is now in the Chris Waller stable. The five-year-old finished second in the 2000 Guineas behind Gleneagles in 2015 and if it can repeat that effort, it wins this race. It has never finished worse than third in three starts fresh up and we wouldn’t rule it out at $13. The Quarterback has turned the corner this preparation with a win in the Gilgai Stakes before flashing home late in the Group 1 Manikato. The Robbie Griffiths-trained gelding loves the Flemington straight with five wins and four placings, and it has a great chance of winning here. Has drawn along the inside of runners which concerns, but the $6 is worth considering. Fell Swoop finished second behind Rebel Dane in the Manikato Stakes and the form out of that race should stack up. The Matthew Dale-trained gelding has had two runs back this campaign for two placings and it has been well supported to win. The four-time winner at this distance is paying $5.50 and it looms as a winning chance with the right run. Spieth hasn’t competed against this level of opposition, but it has looked classy winning its last four starts. The Bryce Heys-trained horse defeated subsequent winner Kaepernick with a storming finish last start and it has experience winning down the straight at Flemington. Can’t rule it out at $9. Redkirk Warrior finished second behind Sir Bacchus at Moonee Valley last start which should be great form for this. The Hong Kong import was good enough to run second in the Classic Cup behind Thunder Fantasy before running 11th in the Hong Kong Derby in 2015. It is unbeaten in two starts second up and it looms as a leading hope at $5.50. Demonstrate is a horse in form after winning its last three. The John O’Shea-trained gelding won well on Melbourne Cup Day and it’s making the quick back up. It drops in weight and bookmakers have set it as the $2.75 favourite, so consider in win bets. Santa Ana Lane is finding it hard to win a race, but it has been running on well enough to consider. The Freedman-trained gelding finished fourth behind Sir Bacchus last start and that looks to be a good form race. Not the worst in this.